Once synonymous with square burgers and little else, Wendy's is catering to rushed parents who want healthy options for their children. 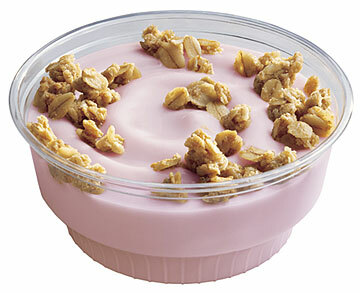 The chain has expanded its Kids Meal Choices with two new deli sandwiches and yogurt-and-granola in a kid-sized cup. Sandwich options include roasted turkey breast and cheese, and Black Forest ham and cheese. Kids (or parents who order for them) may replace french fries with mandarin oranges or strawberry yogurt topped with granola. And as usual, lowfat milk is an alternative to soft drinks. When Wendy's introduced the Kids' Meal Choices program, weekly milk sales jumped from 54,000 to 750,000. Now, if they could just get kids to eat a salad. So you thought Nalo Farms was only about gourmet salad greens? Dean Okimoto, president of the Waimanalo-based farm, is expanding the 23-year-old business to include Nalo Flavors. 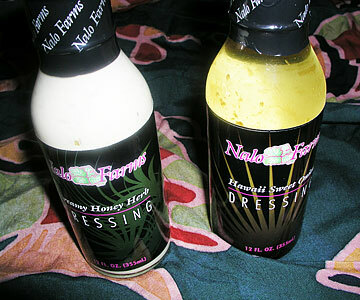 First up is a line of salad dressings, to hit Hawaii's supermarkets in June. The Creamy Honey Herb and Hawaii Sweet Onion garnishes are now available at Oahu Farm Bureau Farmers' Markets in Kailua on Thursday nights, at Kapiolani Community College on Saturday mornings and Mililani on Sundays. Bottles are $6, or $10 with a bag of greens. The flavor-packed blends feature Nalo's home-grown Italian parsley, thyme and basil. Send items to Katherine Nichols, 7 Waterfront Plaza, Suite 210, Honolulu 96813. Or e-mail; knichols@starbulletin.com.